Today we look at Magician of Faith's bigger, weaker brother, Mask of Darkness. 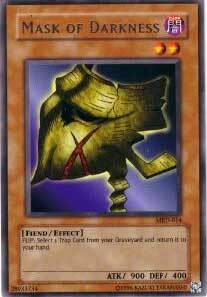 Effect: FLIP: Select 1 Trap Card from your Graveyard and return it to your hand. I'll make this one short. The only card really worth recycling with this is Mirror Force. You CAN use it for Magic Jammer or Trap Hole, but its only real good use is for Mirror Force. Only problem is, now your opponent will see it coming. You are likely to place it down as soon as you can, so all your opponent has to do is play Heavy Storm, and you resign. This critter gets a 2.1. End.